There's already a page on bad habits but I'd like to highlight a few bad habits I've seen with beginners and also try to understand why these bad habits come to existence. Why do players do it? A common bad habit, also known as damezumari or ja choong soo. In the opening and middle game, it's all about stability of groups; you are establishing "viable structures" that are either capable of living or small enough to throw away. Adding stones to these groups while decreasing the number of liberties (or not increasing them) is making these groups bigger but not more viable, so they become a burden rather than a resource. I sometimes see players "completing the joseki" when it only resembles a joseki or the move is not what the whole board position requires. When the move only superficially resembles the joseki move, it is unlikely that it is the best move. In particular, players often "complete the joseki" when the opponent already deviated or played elsewhere. The balance usually found in joseki, is already gone. Black did not react to , leaving White with a or . "Completing the joseki" at is overconcentrating White's forces, since it doesn't react to a destabilizing Black move at a. Slightly better is "completing the joseki" when the whole board position requires another move, locally or globally. Still, it's putting appearance over purpose. They have learned the joseki or seen it in practice a number of times. They remember the shape but don't remember the purpose. They get themselves into a comfort zone by playing a move they (think they) know, when they don't really know what to play. No doubt I still do so today myself. Root cause: substituting thinking with recognizing shapes. In particular: early monkey jumps. Playing endgame moves when the endgame hasn't started, will often result in strengthening the opponent and/or weakening your own stones, by reducing your liberties or improving their connection and eyeshape. This removes your chances to harass groups in the middle game and creates chances for the opponent to harass your groups. 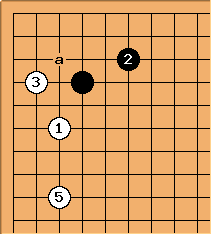 Endgame sequences are set patterns, in a similar way as joseki are. Moves like a monkey jump "jump" to the eye and it is hard to resist playing them when you see them. After all, what can be wrong with gaining points in sente? Well, in the endgame that's the purpose, but in the middle game it's more about health of groups. Root cause: valuing the size of potential territory over the health of groups. Also known as "eat your cake and have it too". It's pretty clear: if you want to invade into the opponent's sphere of influence, the more room you have, the easier it will be to live or get another advantage. If you first reduce the area, the room to live decreases. Also, through the exchange of reducing, the surrounding position will have become solidified and you can no longer threaten it from within. This one is not so easy to explain. I think players first go through the motions of delimiting their territories and find out too late that the relative sizes are to their disadvantage. Then they invade in a desparate attempt. Ironically they are sometimes rewarded for this bad approach, if their opponent is not too good at life and death themselves. Root cause: a lack of positional judgment.